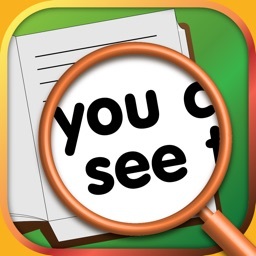 Just open the app, then your iPhone/iPad turns into a magnifying glass. It is very handy when reading hard-to-read things. 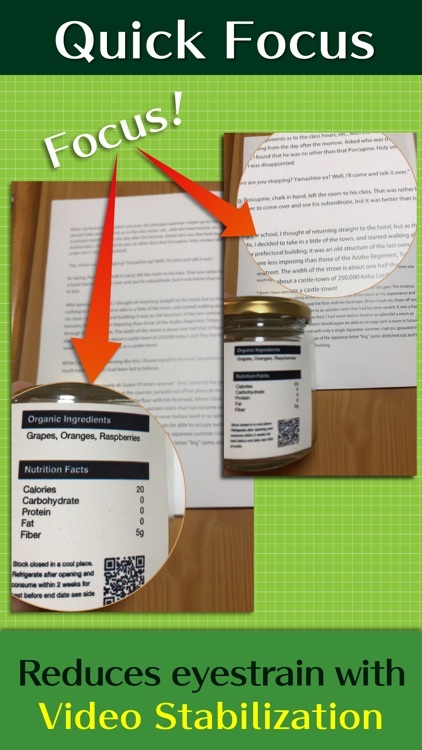 Books printed in small letters, menus in restaurants, labels on the medicine bottles, etc. - Magnifying up to 10x. - Autofocus specially tuned for reading. - Magnifying the loaded photos. - High quality and intuitive user interface. 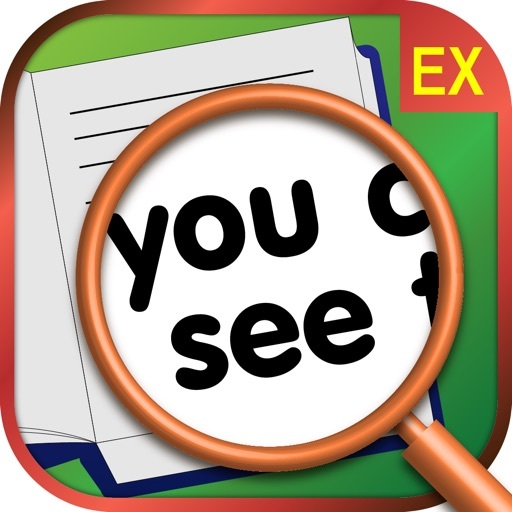 Magniscope EX will help you to concentrate on seeing things. 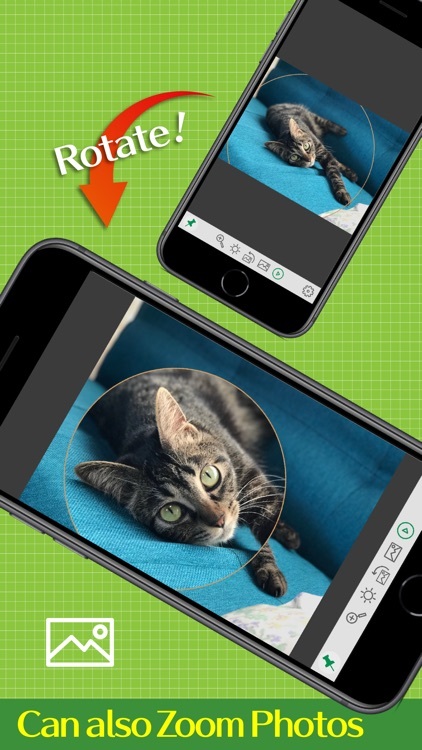 - With autofocus specially tuned for reading, you can see clearly what you want to see. - With automatic exposure, it is possible to always adjust the brightness of the screen for easy viewing. 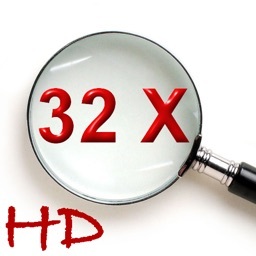 - With video stabilization, it is possible to automatically suppress the blur associated with the motion of the device. 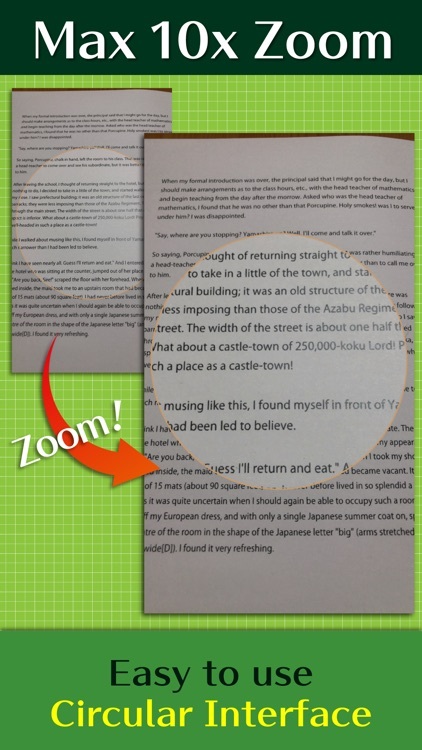 - You can sharpen the image to make the text easier to read. - Filters such as contrast adjustment, color invert, monochrome display, etc. will assist in the easy viewing of colors. 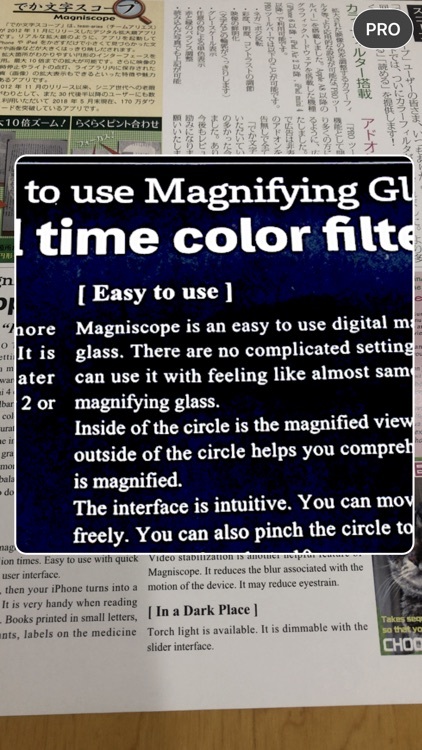 Magniscope EX is easy-to-use. 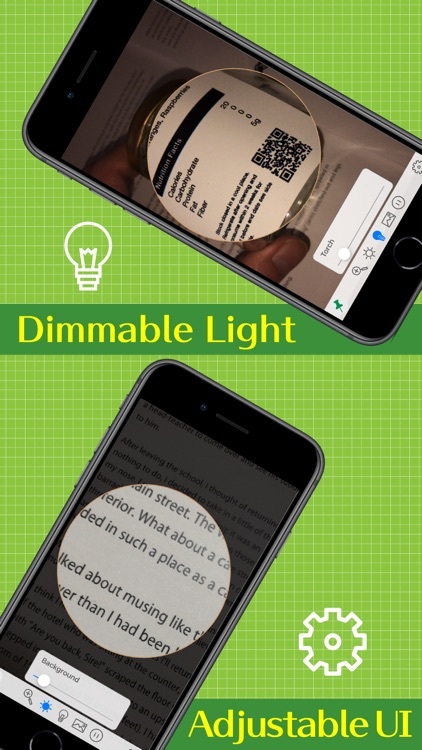 You can use it with feeling like almost same as a real magnifying glass. - Inside of the circle is the magnified view. The view outside of the circle helps you comprehend where you are looking at. 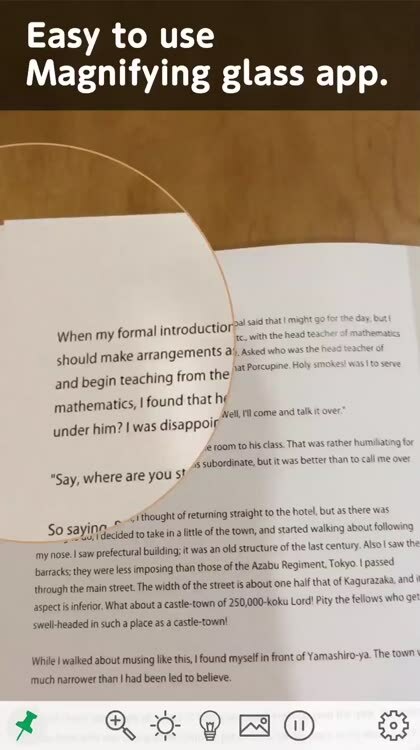 - You can move the circle freely. 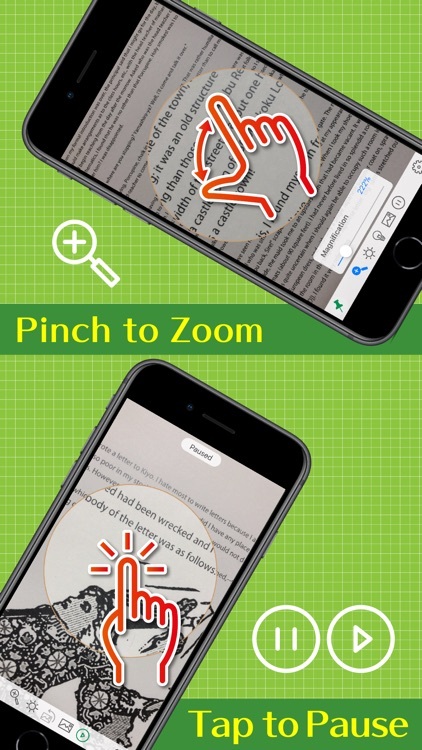 You can also pinch the circle to change the magnification from 1x to 10x. And, you can quickly check the area where is currently magnified by long-pressing the circle. You can access the settings screen with one tap and quickly set various options. 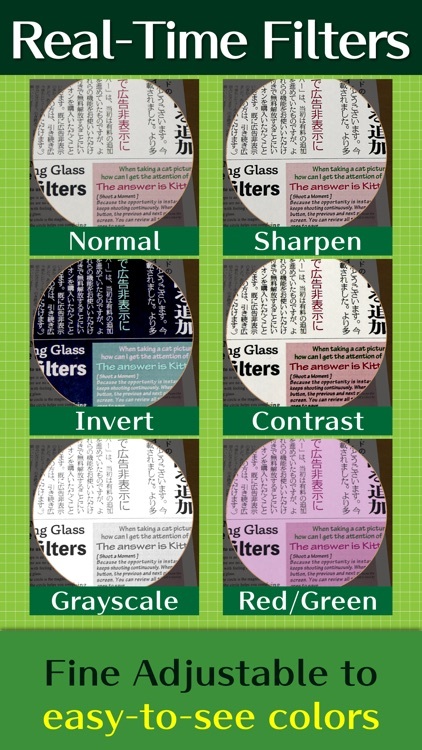 - For example, you can change the size and color of the magnifier circle. You can also change its shape to a square. - Torch light is available. It is dimmable with the slider interface. - It is possible to pause the screen just by tapping. This feature is useful when you want to see newspapers, maps, pamphlets, etc. Pause the screen when the whole area you want to see is displayed. 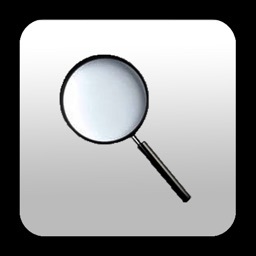 Then you can magnify any place with a finger, without moving the device. - You can also load a photo from the photo library and magnify it on the screen. - It can be set to reduce power consumption. Its useful when traveling. - You can choose the interface orientation by setting. Landscape orientation is suitable for transferring the screen with Screen Mirroring function of iOS. So you can see magnified images on a big screen via AirPlay if you use Apple TV. - Magniscope EX is compatible with VoiceOver. 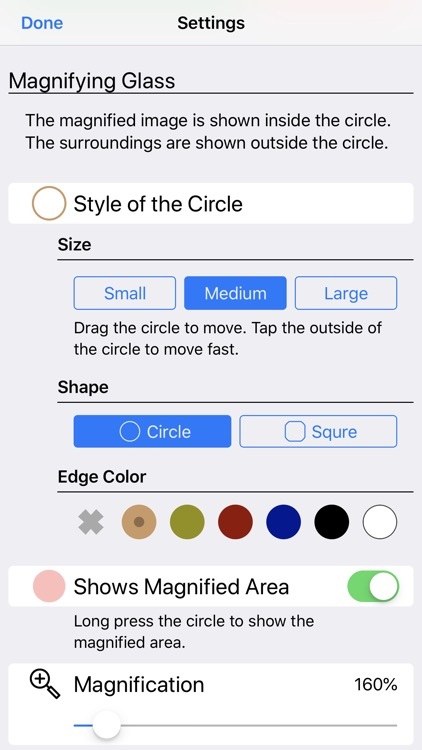 To move the circle, select it and swipe three fingers. 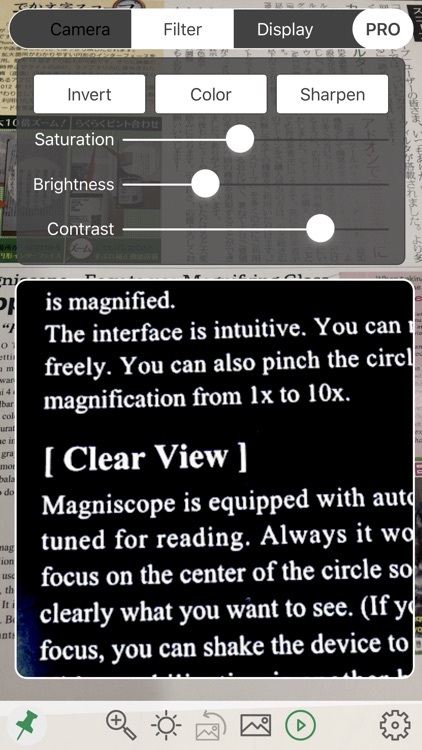 You can use the toolbar buttons to change magnification, to turn torch on, etc. 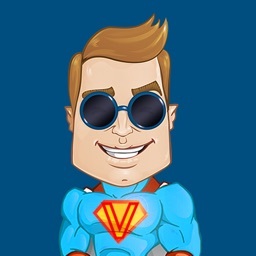 - The size of the app is small. No additional downloads. - No monthly subscription. No additional cost.